There are two things my co-workers hear me say every day. The point is I love these things: My Craft Channel, Heidi Swapp and Diet Pepsi. My Craft Channel is having a Superfan contest and I'm sure I would qualify in my sleep. I'm pretty confident that I have seen every episode and I tell everyone I know how great it is. Heidi Swapp is also on my list of loves. She makes craft magic. I once had a dream that I met her and she called security because I wouldn't stop talking to her. Which is pretty much how it would probably play out in real life if I ever met her. This month on her blog, Heidi is releasing free digital Christmas images. I love them all and wanted to make something really special to highlight them. I had some mini 3x3 canvases and glitter that I bought at Craft Warehouse and they came together to make some adorable vintage ornaments. 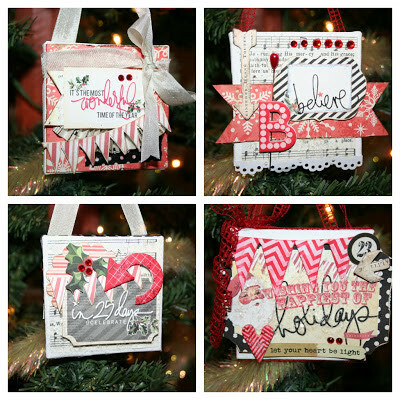 I had so much fun layering and glittering onto these mini canvas backgrounds. I pulled out some HS color magic banners and chipboard shapes and made them just the perfect shade of red. Color Magic is such a cool product. I hung these sweet ornaments on a very special tree I have in my living room. When my grandma passed away several years ago I rescued all of her Christmas decorations. I hang these special ornaments on their own mini tree with the red pointed tree topper she always used. Underneath the tree are some sweet dear she painted that I remember loving as a child. The crocheted tree skirt was actually made by my great grandmother and was given to my mom as a gift. This tree makes me so happy. My HS mini vintage ornaments have found a home there and fit in perfectly. Michelle, thanks for sharing these! They are featured on Heidi's facebook page (and IG feed).